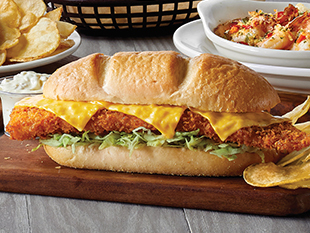 Seafood season will be sailing away soon and so will a few of our fin-tastic limited time items, like our Nashville Whale of a Cod Sandwich and our Shrimp & Cod Scampi. Swim on in with your school of fish to enjoy one last bite before they’re gone with this coupon for $2 off! 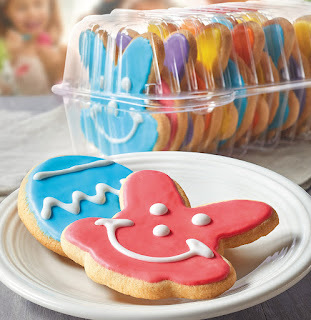 Coupon valid April 18-21, 2019. 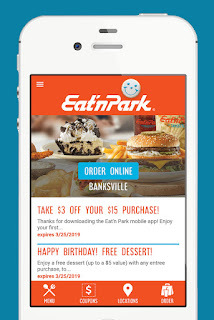 Our Eat’n Park Mobile App has a fresh new look! 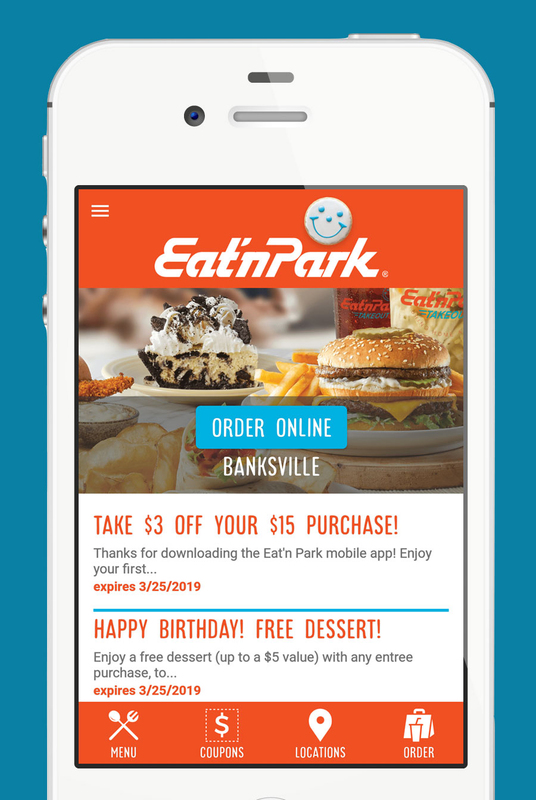 Available for both iPhone and Android, our app allows you to receive and redeem mobile coupons directly from your device, no printer needed. 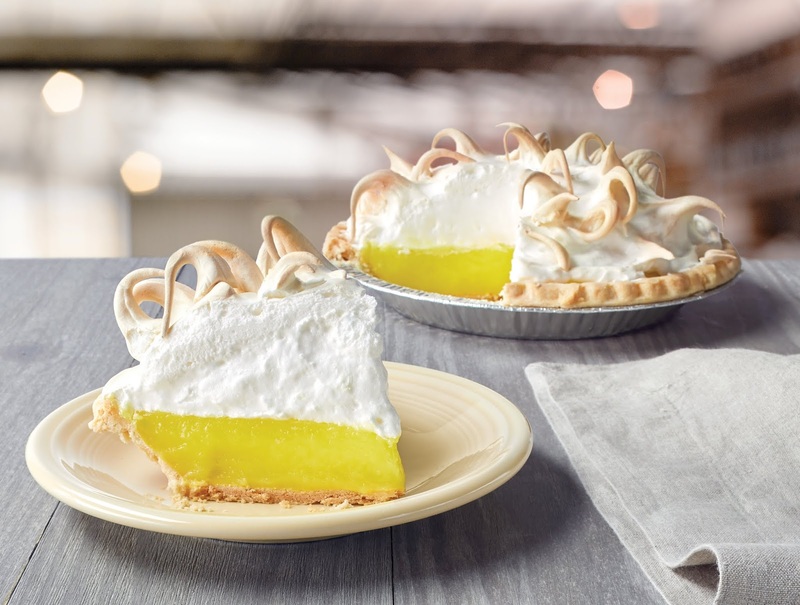 Plus, you’ll get special offers for both your birthday AND anniversary! Many of our team members are active volunteers in their neighborhoods, and we do what we can to support them in those endeavors. 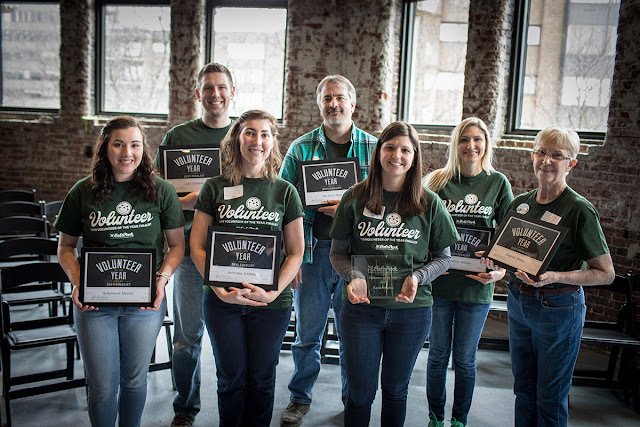 Every year, we recognize those who have gone above and beyond by generously giving their time and energy to support causes in their local communities. 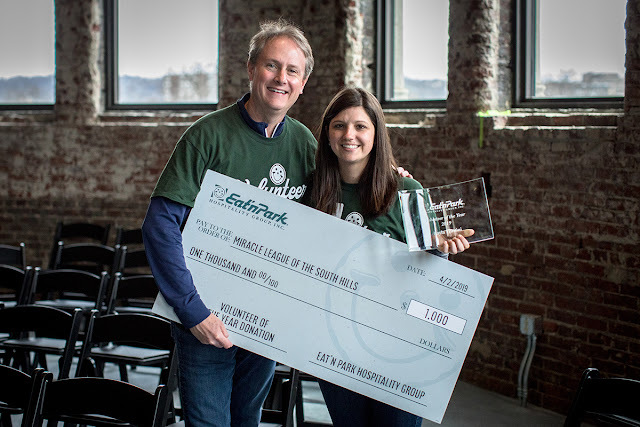 Out of all of our team members who volunteered over 37,000 hours of their time in 2018, we’re proud to announce that this year’s Eat’n Park Hospitality Group Volunteer of the Year is Kayla Frattini! Our Eat’n Park Hospitality Group CEO, Jeff Broadhurst, with our 2019 Volunteer of the Year winner, Kayla Frattini. Kayla, our Hello Bistro Marketing Manager, spends most of her volunteer life investing in two separate organizations. The first is the Miracle League of the South Hills, which gives kids and adults with disabilities the opportunity to play baseball. Kayla coaches two Miracle League teams – an adult team and a youth team. Because she spends so much time with the athletes, she has developed really close bonds with many of them. One even recently asked her to his high school prom! Kayla’s second passion project is with Team PHenomenal Hope, an organization that raises funds and awareness for a rare medical condition called Pulmonary Hypertension. Over the last few years, Kayla has gradually increased her level of involvement in the organization’s annual 5K fundraiser from participant to now serving as the Race Director for the second year in a row. Kayla’s favorite part about volunteering, and probably the core reason that she dedicates so many hours to service, is that she is helping to build a community of inclusivity. On Kayla’s behalf, Eat’n Park Hospitality Group will be donating $1,000 to the Miracle League of the South Hills. Please join us in congratulating Kayla and our other finalists for their extensive efforts in the community! Giving back to our community is in our DNA. 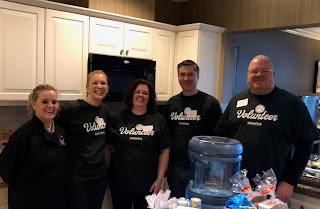 On April 2nd, we held our 4th Annual Day of Smiles, an event that gathered over 150 of our team members to volunteer at 11 different community service projects around Pittsburgh. 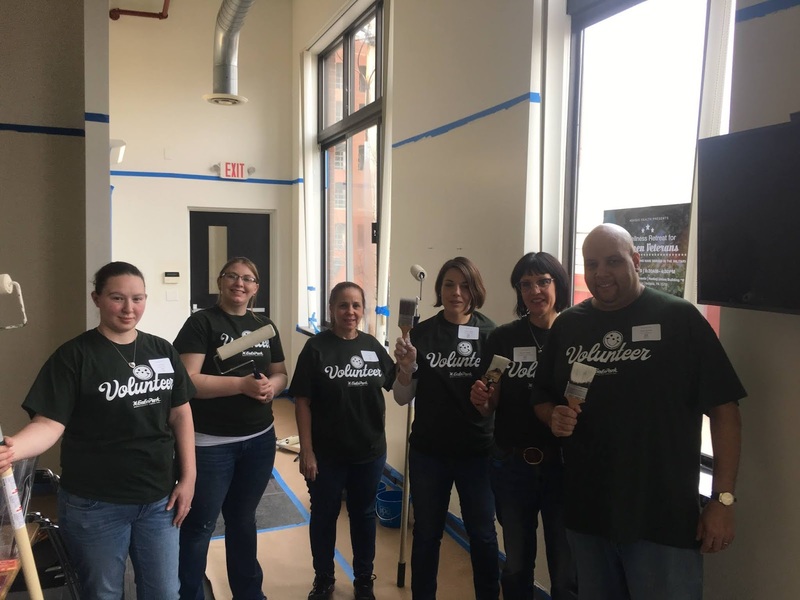 On Day of Smiles, four of our service projects were focused on “Hero Smiles” with the goal of enhancing the lives of military veterans and their families. Read on to learn more about these volunteer projects! A few of our volunteers teamed up with Veterans Leadership Program of Western Pennsylvania for some painting projects around the office to make it extra inviting for the Veterans being provided with services there. VLP provides many services to eligible local veterans, service members, and their families including housing, employment, and other vital support services with the goal of improving their self-sufficiency, sustainability, and quality of life. This crew of volunteers assembled care package kits, which were then distributed to well-deserving veterans receiving medical care at the VA Hospital in Oakland. 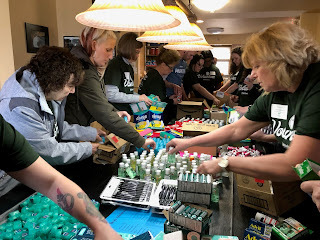 Some veterans stay at the hospital for extended periods of time, so the kits were full of supplies that they may not have had the opportunity to pick up for themselves. Our last group of volunteers were hard at work completing various tasks at Shepherd's Heart. They restocked and organized the pantry, and did some landscaping. Shepherd's Heart provides transitional housing for Veterans, as well as meals and a place to shower and do laundry for the homeless. Our nickname may be “The Place for Smiles” but we also love creating smiles within our community. 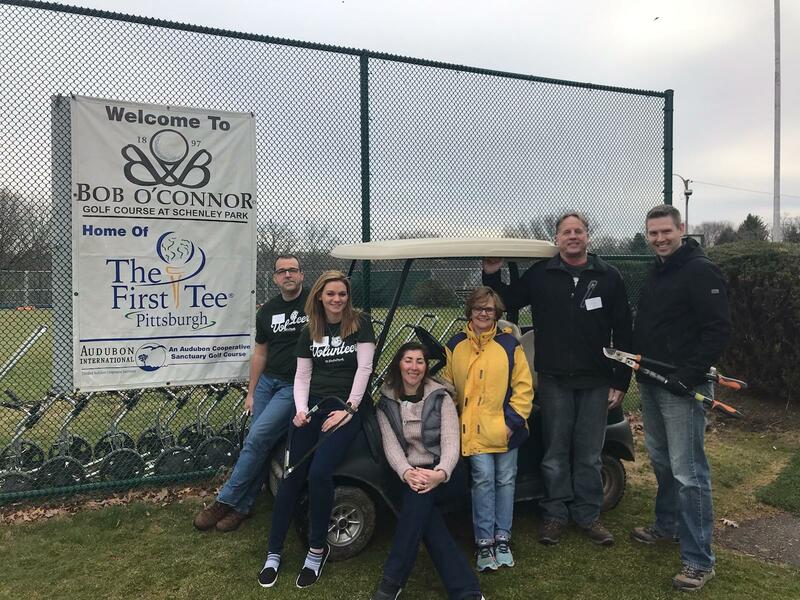 On April 2nd, we held our 4th Annual Day of Smiles, an event that gathered over 150 of our team members to volunteer at 11 different community service projects throughout the city. On Day of Smiles, four of our service projects were focused on “Sharing Smiles” by supporting family wellness and fitness. Read on to learn about how our team spent their day! A team of our volunteers visited Munhall to help the Best of the Batch Foundation, which was established by former Steeler, Charlie Batch. They helped to put together hygiene kits for kids in the after-school program! 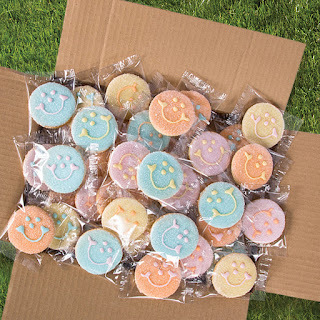 Camp Guyasuta is a day-camp and Boy Scout camp focused on outdoor play and activity! 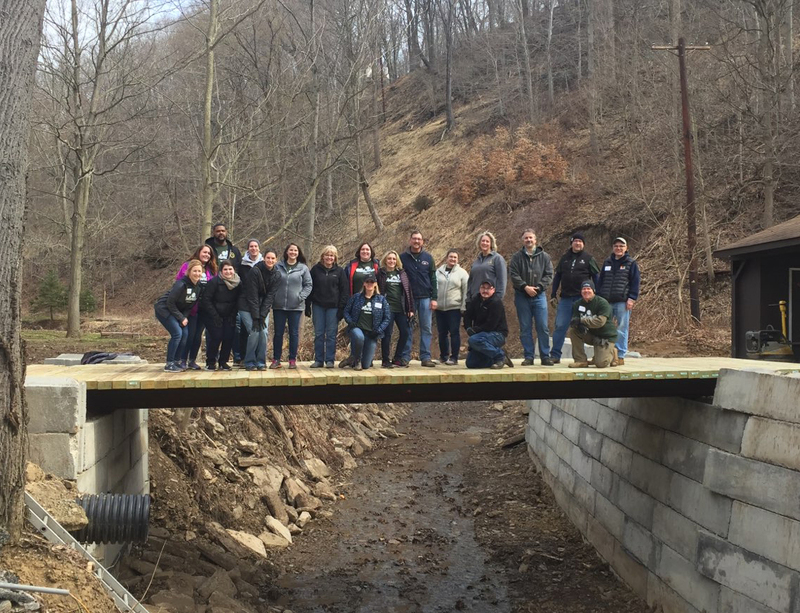 The camp was impacted by severe flooding a few months ago and our volunteers helped to get the grounds into tip-top shape in time for summer! They even helped build a bridge!